so you can transmit a PC’s content tomultiple displays. 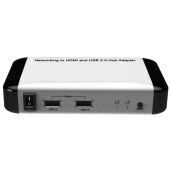 With the mini USB host port, you can connect it to local PC directly to watch PC’s content on a large HDTV or projector. With two USB device ports, you can connect some universal USB devices, such as mouse, keyboard, U disck, hard disc, printer. Support Operating system for computers.